Welcome to Legends of Sorcery, the magical companion sourcebook to RPGObjects' Legends line of historical fantasy supplements. Past products in the Legends line have walked a fine line with magic, either incorporating a limited magical presence into the rules themselves (as was done in Legends of Excalibur) or publishing magic rules for each setting in a separate book for the Gamemaster to use or exclude as appropriate for his particular campaign (as was done in Legends of the Samurai). Legends of Sorcery takes the latter approach one step further, serving as the magic supplement for all future books in the Legends line. From this point forward, Legends books will be written as magic-free historical sourcebooks, providing historical information and combat classes. 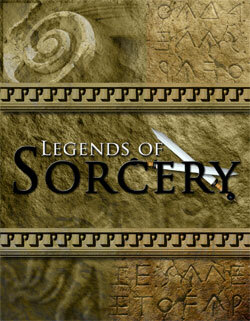 They will include guidelines for using Legends of Sorcery to add magic to the setting or time period (if desired). What's different about Legends of Sorcery? Legends of Sorcery is a skill-based magic system that abandons the spell slot system found in traditional fantasy d20 games derived from the SRD. It also abandons the spell point alternative used in past Legends books. Spells are cast with a skill check; the result of failing this check depends on the margin by which the skill check failed. Characters learn spells the same way that they cast them, except that learning a spell (adding it to the list of spells a character can use) is somewhat easier than casting that spell in the heat of battle. In addition to using a skill to represent spell casting, Legends of Sorcery also introduces the concept of the Base Magic Bonus. This represents the magical power inherent in the character's class, and serves as a modifier to any skill check the character makes to cast or learn a spell. What's the same about Legends of Sorcery? More than you might think. In this system, a character's spellcasting ability is limited by his skill and magical power, not by the number of times each day he can cast a given spell. However, Legends of Sorcery still uses spell levels, and all the spells in the PHB and other 3rd-party supplements will work under the rules presented here, should you wish to use them. This product changes the way spells are learned and cast, but does not alter the spells themselves. A new skill based casting system. 11 spell casting core classes: Alchemist, Artificer, Elementalist, Hermit, Holy Man, Monk, Naturalist, Pagan Priest, Priest, Sage, Seer, Trickster. New and modified metamagic feats.